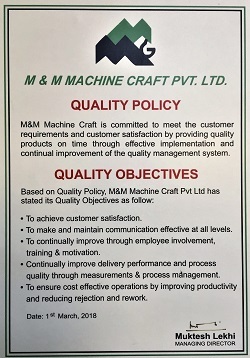 M&M Machine Craft is committed to meet the customer requirements and customer satisfaction by providing quality products on time through effective implementation and continual improvement of the quality management system. To make and maintain communication effective at all levels. To continually improve through employee involvement, training & motivation. Continually improve delivery performance and process quality through measurements & process management. To ensure cost effective operations by improving productivity and reducing rejection and rework.